If you are planning a themed or unique style of wedding, it makes sense to go all in with respect to the wedding. This means that you want a continuous style to your happy occasion and this includes your wedding invitation. A wedding invitation with a starfish on it may not seem like the most appealing option to most brides and grooms but for some happy couples, this is going to be the perfect way to spread the news about a very happy day. If you are planning a beach wedding, a wedding that takes place abroad or you just have a passion for life by the sea, this is an invitation that will help you to let everyone know all about the event or your passion. The invitation comes with a bright starfish taking centre stage, but there is still plenty of space to provide all of the information that you need to pass on to your guests. The style of the card will strike you as a promotional item for a holiday or a stylish design company looking to show that what they can offer. This means that it is far from your traditional or standard wedding invitation but if you are far from being the traditional couple, this could be the sort of quirky and celebratory wedding invitation that is perfect for your needs. 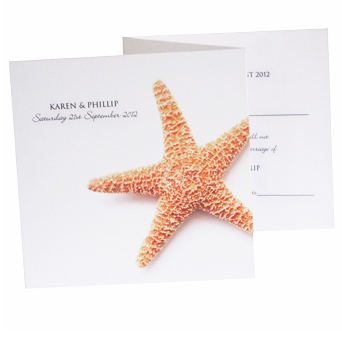 With a range of wedding stationery available in the same style and perforated RSVP strips to make sure everyone can respond to you in an easy manner, the Starfish Z Fold wedding invitation from Bee Happy Designs is the ideal invitation for couples who think that life is a beach. Tags: Beach, Seaside, Starfish, Travel.